One easy way to form a stable partnership is to become the supplier for restaurants close to the site of your farm. Those restaurants are going to have skilled chefs who are in constant need of fresh crops and ingredients. If you own and run a family farm, then you know what it’s like to be on the lookout for any possible sources of revenue. One easy way to form a stable partnership is to become the supplier for restaurants close to the site of your farm. Those restaurants are going to have skilled chefs who are in constant need of fresh crops and ingredients. You need to determine who your potential buyers are. The famous restaurants that will help grow your reputation could already be affiliated with other farms. And both fast food restaurants and smaller cafes have supply lines they arrange with wholesalers, so negotiating with them might be a difficult prospect as well. That said, all hope is not lost. Find if there are farmers markets you can sell to, and inquire about other restaurant locations which could be looking to reinvent their menus. Bed and breakfasts and traveling chefs are also possible customers, since they’ll both be in need of the best tasting hydroponic vegetables and other foodstuffs you can provide them. If there just so happens to be someone like this who wants to incorporate organic items into their routines, then that represents a goldmine for you. The next piece of advice we can give you is to get started already. Now, this doesn’t mean you should focus your energies only growing huge batches of products that might go without an audience. 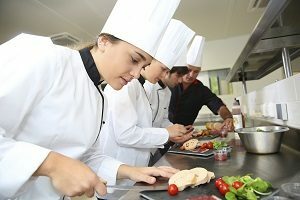 You should reach out to the chefs you are interested in working with because more often than not, they are responsible for purchasing produce and ingredients that their establishments need on a weekly, if not daily, basis. Try creating samples that best represent your most delicious items and put your best foot forward. Even if you are an experienced grower, that doesn’t mean you can’t learn as you go. Eventually, you can move from your existing stockpiles and growth cycles to creating schedules and organizing deliveries tailored to each customer you supply. You’ll gain vast amounts of experience, and you can even bolster your relationship by having the chefs you work with come to visit your farm. Take them on a tour of your greenhouses and show them the vertical farming techniques you’ve been working on lately! This entry was posted on Friday, February 9th, 2018 at 11:49 am. Both comments and pings are currently closed.